The top 10 Five-Minute RV Maintenance Tips. Of course, Lerch RV has an RV service department with the latest in diagnostic and repair tools and parts that can handle just about any problem your RV faces. I say, why not just avoid RV problems all together. Here are a few quick and easy RV maintenance tips you can follow on your own to keep your camper in great shape from year to year. Check sealants twice each month – check the rubber sealants around your windows to make sure they’re tight and not cracking. Cracked or loose sealant can let air in which causes drafts and leaks. Check tire pressure before every trip –this one should be a no brainer. Make sure your tires are fully pressurized before you set off on your next road trip – it’s an easy RV maintenance tip that will prevent blowouts and it also improves your gas mileage! Run generator 2 hours per month under 50% load –letting your RV sit unused for months is not good for the generator. Run it under a light load for a few minutes each month to keep it primed so that it is ready the next time you decide to hit the road. Check battery water level–making sure your batteries have enough water in them is crucial to ensuring that they will hold their charge. Check your battery water level frequently and add distilled water when necessary. Disconnect your battery from your camper when not in use, to prolong your battery’s life, use a battery maintainer (trickle charger) to keep it up to charge. Clean holding tanks regularly –clean out your gray and black water tanks frequently to prevent bacteria and odors from leaking into the rest of your RV. Black and gray water tanks can get really gross, really fast – this is one RV maintenance tip you don’t want to forget! If you have to spend a vast amount of time on the road, cleanliness is a must. Lube slide rails and gaskets twice each year –make sure all your slide-out rails and all gaskets on your RV are properly lubricated to avoid friction. This will help make sure your slide rails stay in working condition all season long. Torque lug nuts before each trip – it is very important that you always make sure your lug nuts are fastened tightly before you head out. This RV maintenance tip is crucially important – if you’re not careful, your whole wheel assembly could fly off! Accidents slow down trips and can drain your pocket-book, this type can be easily avoided. 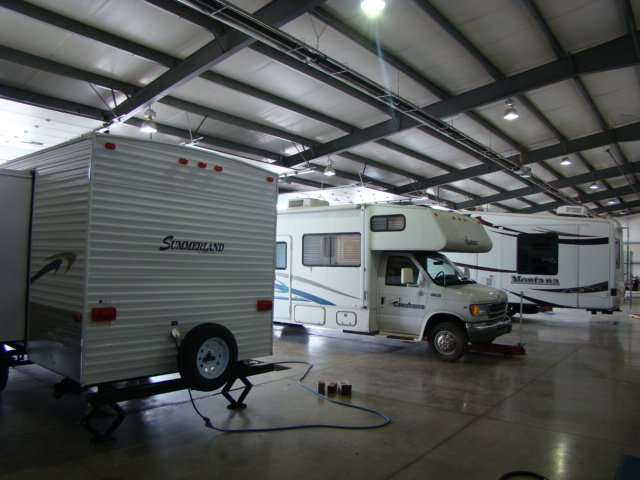 Sanitize fresh water system each spring – this is an RV maintenance tip that you should follow at the beginning of the RV season. Before your spring RV season starts, make a point to thoroughly sanitize your fresh water systems to keep your drinking water fresh and clean. Properly winterize each fall –this is one of the most crucial RV maintenance tips that you can follow. Before the winter hits it’s absolutely necessary to follow all of the steps to winterize your unit to protect it from the winter cold and lack of use (if you need help, check out our previous posts about how to winterize your RV!). Retract awning during heavy wind and rain – this RV maintenance tip is extremely important. On at least one of your camping trips you’re going to have to weather a storm. Make sure your awning is pulled back – otherwise, it’ll collapse like an umbrella and bend like crazy. Not to mention could invert and go over your roof! If you follow the above RV maintenance tips throughout the season, you may end up saving thousands of dollars in service costs! And remember, for all your RV maintenance and service needs, visit Lerch RV in central Pennsylvania. This entry was posted in 5th Wheel Campers, Campers, Camping, RV, RV Dealer, RV Lifestyle, RV service, RV Towing, Travel, travel trailers and tagged Awning, battery maintenance, camper dealer, camper service, Camps, dealer service, Go RVing, Lerch RV, PA RV dealer, Pennsylvania, RecreationalVehicle, rv dealership, RV maintenance, RV service, rv tire maintenance, service department. Bookmark the permalink. This is a great article! Also, keep in mind that an RV cover may come in handy to protect your vehicle while on the road.